The Wind Energy Institute of Canada tested Zephyr Corporation’s Airdolphin GTO Z-1000-250, an ultra-light wind turbine. The testing leading to certification of the turbine was done to the American Wind Energy Association (AWEA) standard with certification under ClassNK. The testing included power performance, acoustics, duration, and safety and function. The turbine can be seen in the photo below. This turbine is the result of a joint industry-government-academia initiative in Japan which combines state-of-the-art technology with Japanese craftsmanship. 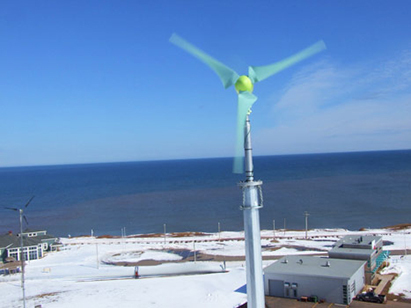 The Wind Energy Institute of Canada installed and tested the EOCYCLE 25 Direct-Drive Wind Turbine. The testing leading to certification was done to the American Wind Energy Association (AWEA) and the British Wind Energy Association (BWEA) Standards, now known as RenewableUK. At the Institute testing of power performance, acoustics, duration, and safety and function were completed. Eocycle technologies is a Canadian company out of Québec and is the designer and manufacturer of permanent magnet electric generators and motors for low-speed, high-torque applications. The Wind Energy Institute of Canada (Institute) has established the Visiting Professional and Peer Review Program (VPPP) to enhance and recognize the contribution of professionals in the field of wind energy. by having the Institute peer-review your document. professionals who are beginning their careers and are seeking to gain more experience. mid-level professionals who find themselves with newly added job responsibilities. academics who are seeking experience in industry during their sabbaticals to ensure the relevance of their research to the wind industry. Five 2 MW wind turbines. Test bed for energy storage system (currently holds a 1 MW/2 MWh battery energy storage system). Energy storage for reliability and economics. mproving understanding of our wind resource. VPPP participants who visit the Institute will work side-by-side with the Institute’s experienced staff, management, and Board of Directors on projects that are of interest to the Institute and the participant. VPPP participants will enhance their skills and knowledge through access to the Institute’s state of the art facilities; discourse with Institute staff; connections to the wider Canadian and global wind energy network; and access to modern, fully furnished, accommodations on the Institute’s site. Participating in this program gives visiting professionals the opportunity to make a significant difference to the development of wind energy in Canada and to further enhance their own careers in wind energy. An additional way by which professionals and academics can interact with the Institute staff is through the Institute’s peer review of documents including scholarly articles, reports, presentations, proposals, and white papers. As research becomes more interdisciplinary, it is becoming more difficult for any one person to understand all aspects of a research project. Moreover, it is important for academic authors to ensure that their research is relevant to industry. The Institute has a multi-disciplinary team with considerable experience in all aspects of wind energy as well as close ties to industry. They offer a timely peer-review process that can boost the quality of documents before they take their next steps. Professionals eligible for this program may be from public and private organizations, including industries, universities, research institutions, government, utilities, and system operators. All applications under this program will be considered whether they are for one week or for more than one year. If the applicant is eligible for Natural Science and Engineering Research Council Scholarships, Work Smarts, or other funding opportunity, the Institute will work with the applicant towards receiving this funding. The Institute, founded in 1981 and located at North Cape, Prince Edward Island, is a not for profit, independent research and testing institute. The Institute’s mission is to advance the development of wind energy across Canada through research, testing, training, and collaboration. With Federal funding from the Department of Natural Resources’ Clean Energy Fund, the Institute has built a state-of-the-art $25M, 10 MW wind park with a 1 MW/2 MWh battery energy storage system. 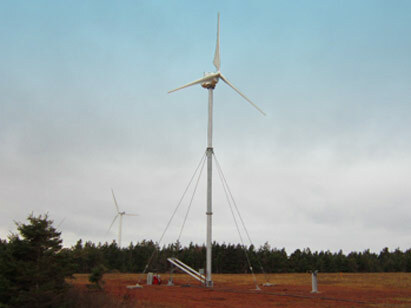 The Institute’s site has a strong wind resource and 300o exposure to the Gulf of St. Lawrence. The Institute has been performing wind turbine duration testing and consultation services since 1981. With over 35 small wind turbine installations at our site, our highly qualified staff can provide guidance/expertise on the development or testing of technologies. Utilizing our facilities and expertise, the Institute tests wind turbines to standards such as International Electrotechnical Commission (IEC), American Wind Energy Association (AWEA) and RenewableUK Small Wind Turbine Standard. The Institute is a leader in research, development and demonstration projects undertaken in collaboration with private/public sector companies, research institutions and governments nationally and internationally. We also act as a facilitator to bring organizations like the industry association and academia together. WEICan has formed a Research Committee composed of two board members, Amy Hsiao and Rob Brandon. The Research Committee reviews the status (financially and technically), relevance, and risks of the research projects that are in place, proposed, or have been recently completed on an annual basis and compares the achieved outcomes with what was anticipated the year before. As a not-for-profit, the Institute is often called upon by government, public/private sector companies and academia to provide expert advice and input to policy and program development. The Institute has also acted as an expert industry representative for the Canadian government at international events. Staff regularly attend/present at conferences, industry/academic events, and government meetings (international and national). We also offer a Visiting Professor and Peer Review Program (VPPP) that allows for job shadowing at all levels of the organizations, internships, co-op placements, peer review of papers, etc. The Institute strategically supports college and university wind energy training programs and engages in outreach and public education efforts to support its mission.